Hey everyone! I wanted to fill you in on what’s happening up on beautiful Devils Lake North Dakota!! I had the priveledge of taking a tremendous group of guys from Illinois over this past weekend. They were some of the most fun, down to earth guys you’ve ever met and they were also good fisherman. We had three days scheduled and were greeted with amazing and comfortable weather on all three light winds 5-10 miles an hour that would die off in the afternoons paired with partly sunny skies. We employed three different tactics depending on how we wanted to attack the fish. Trolling bottom bouncers with Berkley Gulp was productive along with bobber fishing. I was running low on leeches so we also used pieces of crawlers. They worked just fine as a replacement. On day three after our group had a fish fry prepared by the local resort we only needed a few fish to take home for their possession limit. They wanted to change it up a bit and I was open to ideas. We found a nice clean hump out in the open water. We fished #7 jigging raps in about 15 feet of water on top of the hump. This technique was new to these guys but they performed wonderfully. The biggest caught was a 23″ beauty of a picture fish and they kept their remaining fish to round out their possession limit. I even kept a couple fish for a family dinner with my wife. The fishing will only be getting better and more consistent bite windows as this end of summer/early fall continues. The spinners will be put away and you will see more crankbait activity. 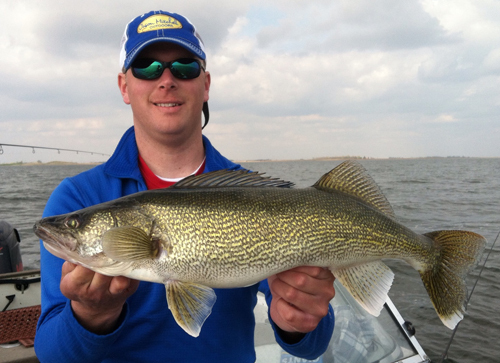 Some of the best fishing and largest fish of the season is in the upcoming months. I have openings in September and October on both Lake Sakakawea and Devils Lake. I have lodging available as well if needed. Please reach out with any questions or availability on dates to fish! See you on the water! !